Our annual Florida Keys trip just got even better! Ditch your wetsuit, slop on the sunscreen, and hop on down to the tropics! This year we are ramping things up. We have a variety of lessons and riding packages as well as super sweet add-ons for accommodations, gear rental, and even gear transport! Butter Flat Shallow Conditions and Plenty of Sun, Sun, Sun! 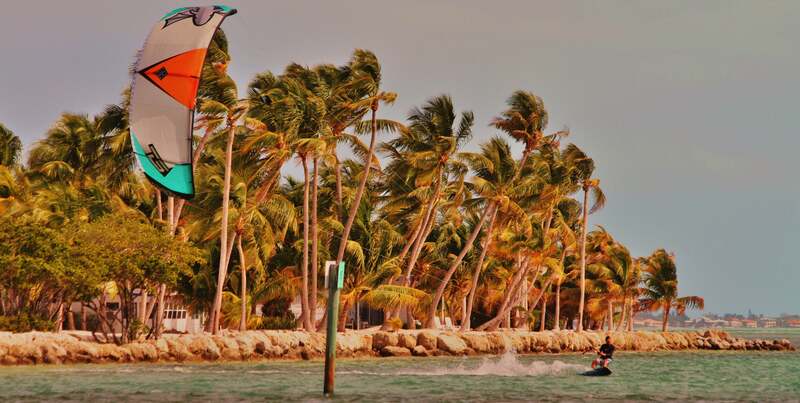 Have you been meaning to learn how to Kiteboard and want to do it all in a week? This package is designed to get you kiteboarding as quickly as possible with no equipment or experience necessary. This is a package that features seven days and nights in the warmth of the tropics! This also includes an average of one lesson per day, depending upon weather conditions with NY Kite Center’s expert instructors. The price of this package includes all gear and it will be provided by NY Kite Center. NY Kite Center is proud to offer the Key Master Package for 2015. This custom package option is designed on a per person basis, as it covers advanced kiting techniques that are individual specific. Want to learn how to jump? Want to learn a few new tricks? No problem. The Key Master package offers just that. Advanced kiting instruction designed with your needs in mind. Can you ride but cant stay up wind? Do you know the basics but need assistance? The Board Time package is designed for those who are able to kiteboard but are unable to stay up wind on their own. Includes an average of one session per day, depending upon weather conditions with NY Kite Center’s expert instructors. Do you want to Teach Kiteboarding? NY Kite Center is offering an assistant IKO course during this week to train new instructors. This is a prerequisite for the full IKO instructor training course, so a great opportunity to get started… Please note that in order to take advantage of this package, kiters must be able to stay up wind , ride toe-side and land jumps. NY Kite Center is proud to offer the Island Hopper Package for 2015. As our most popular option, this allows intermediate and advanced kiters the opportunity to bring their own gear and discover secret spots from our expert coaches. Please note that in order to take advantage of this package, kiters must be able to stay up wind and possess intermediate or above kiteboarding skills. $80 per pickup or emergency rescue. Just get yourself down there and we’ll handle the rest! Accommodation subject to availability. Please call for room rate details. This is an add on to the Key Master, Board Time, Gatekeeper IKO Assistant Course, or Island-Hopper Packages. It allows kiters to get their hands on and try out a variety of gear from several manufactures. If you are interested in renting for the entire week, please call NYKC for weekly rental package pricing! Save the hassle of transporting your gear to and from Florida. We’ll bring it down for you! Maximum of 3 kites, 3 bars, and 2 boards. $25 per additional item.